And just like that it is Christmas Eve! It’s crazy to think 2017 is quickly coming to an end! Are you starting to think about the New Year yet? Are you a resolution maker? We only have one resolution this coming year – to help as many people as possible discover the healing power of real food! Read more about our resolution below. 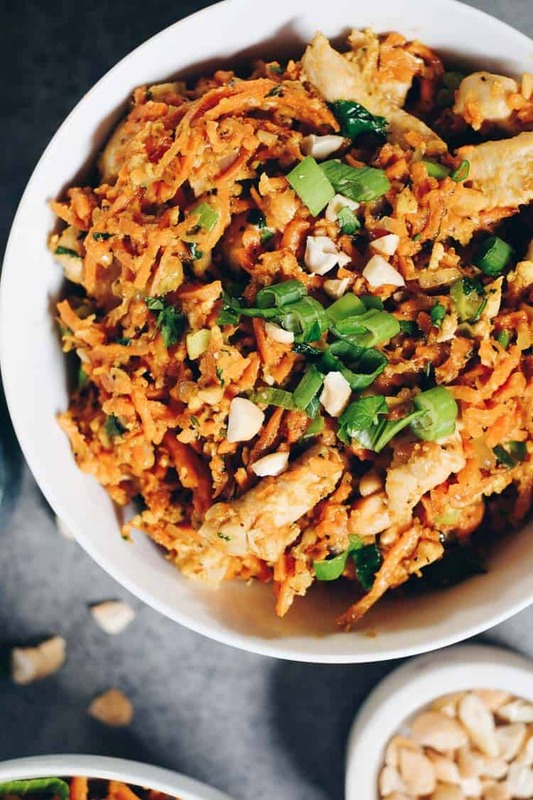 In the meantime though…get excited for this non-traditional sweet potato chicken pad Thai! Thai food used to be a go-to for me and a set of flavors that just always sounded good. To be honest, it is the one type of cuisine I’ve truly missed since going Paleo. 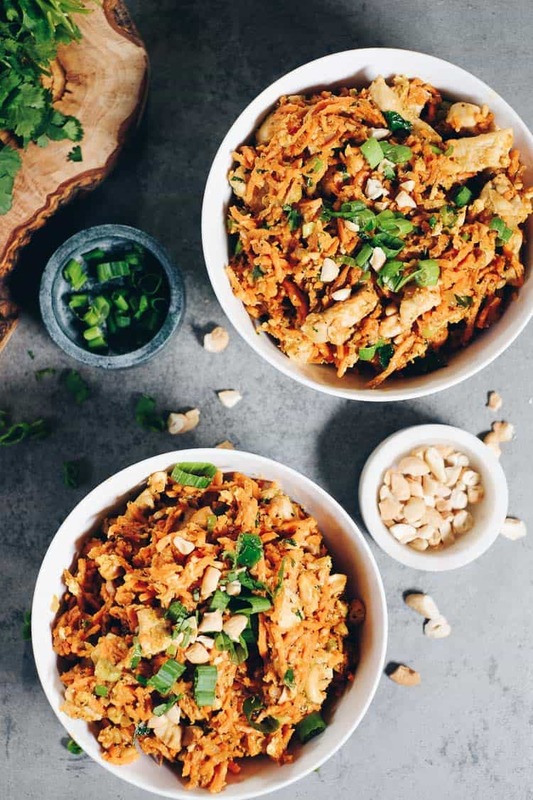 Lucky for you guys though, Justin created this flavorful and vibrant sweet potato chicken pad Thai that is sure to be a new favorite. 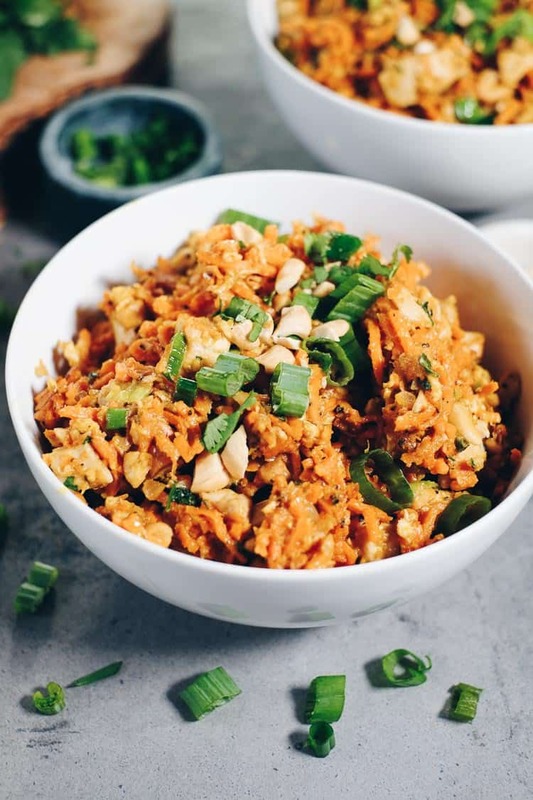 It has the Thai like flavors but with healthy sweet potato noodles, creamy cashew butter and coconut aminos instead of peanut and soy. You will love how tasty and comforting this dish is. We have one resolution for 2018. It is to help as many people as we can to discover the healing power of real food. Do you feel tired all of the time, are you irritable, do you have digestive issues, are you often bloated (especially before bed), do feel like your head is in a fog, do you suffer from headaches or migraines, do you get cold sores often? The list goes on and on..…but if any of these symptoms sound familiar to you, I’d highly recommend doing a January Whole30. We will also being doing a January Whole30 and you can join us! We’ve designed the meal plan with shopping lists and extra resources. Doing a Whole30 is not a cure-all – in fact it is not meant to diagnose or cure anything. However, as I can share from my own journey, it can be a very transformative experience. 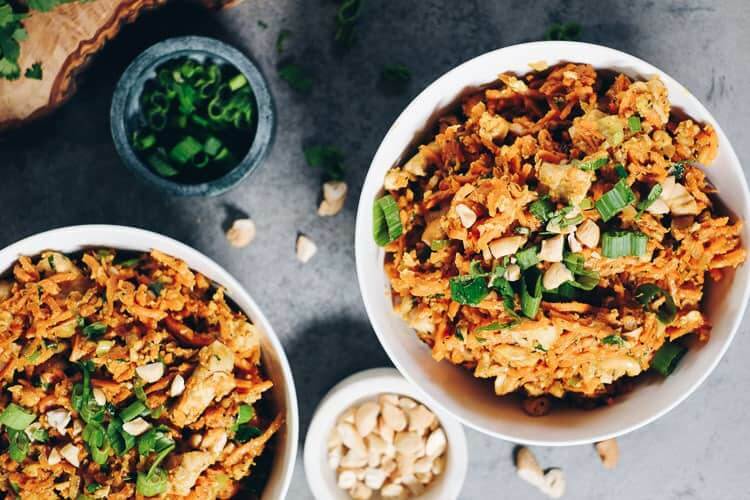 Plus, you’ll get to eat tasty meals, similar to this Sweet Potato Chicken Pad Thai. My own journey of managing Multiple Sclerosis with diet, lifestyle and fitness has been a long, windy road. I was diagnosed 10+ years ago. Truthfully, I haven’t gotten it right every time, but I have learned A TON, and I have found what works for me – eating real food, reducing life stressors and staying active by teaching and taking barre classes. From my own experience and my experience helping those around me, one of THE BEST ways to change the course of your health story is to do a Whole30. Are you familiar with the Whole30 program? Well, the creators developed a 30 day program where you focus on eating only real food, eliminating processed foods, dairy, grains, legumes, sugar (some fruit is ok) and alcohol. While this sounds intense, and it is, in my opinion it is the best way to reprogram your body to function as it is meant to. Want To Do A Whole30 With Us?? Are you intrigued? Are you ready to take a bold step to change your health story? It’s not too late to change the course of your health. I can speak from being in a place where I suffered from fatigue, migraines, digestive issues (among other symptoms) and was basically just going through the motions in life to finding health and creating a vibrant life. Do it for YOU this coming year! To make your Whole30 easier we’ve put together a 30-day Meal Plan complete with weekly shopping lists, efficient make-ahead meals, flexible prep instructions and more. Our meal plan utilizes leftovers to minimize cooking time and is highly organized so all you have to do is follow the instructions. It features complete and balanced meals for the entire duration of your Whole30. I’M IN! SIGN ME UP NOW!! 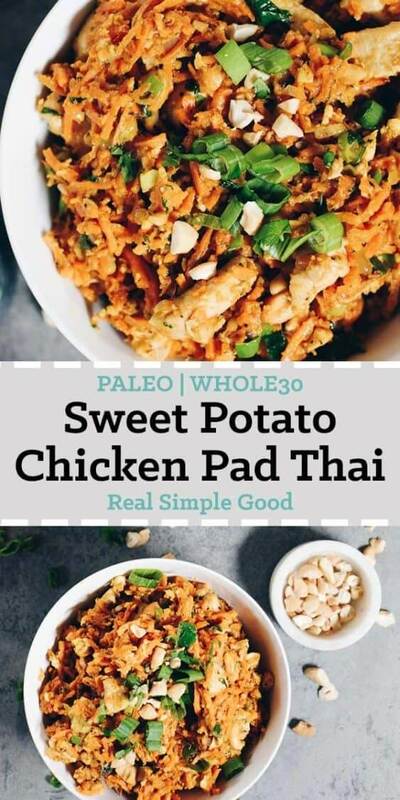 Sign up to join us on our January Whole30, and then go make this sweet potato chicken pad Thai! You will love the flavor combo and enjoy a new way to re-create Thai cuisine. Let us know how it goes by leaving a comment below. Also, take a photo and tag us on Instagram @realsimplegood, so we can check it out! 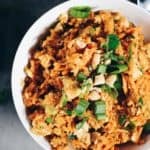 This Sweet Potato Chicken Pad Thai has Thai flavors but with healthy sweet potato noodles, creamy cashew butter and coconut aminos instead of peanut and soy. You will love how tasty and comforting this dish is. First, make the sauce by combining all of the sauce ingredients into a small bowl or jar and whisking well. The sauce will be thick, but mix it up as much as you can to get a creamy consistency. Set aside. Chop chicken as noted. Chop shallot, garlic, green onions, cilantro and cashews. Turn sweet potatoes into noodles using a spiralizer. Heat a large skillet over medium heat and add in 2 tbsp sesame oil. Once hot, add the sweet potato noodles. Toss with oil and season with a big pinch of salt and pepper (about 1/2 tsp each). Cook, stirring occasionally, until the noodles are tender but not too soft, about 6-7 minutes. Remove and place on a plate. In the same pan over medium heat, add in 1 tbsp of sesame oil. Add in shallot and garlic to saute for 1-2 minutes, stirring constantly. Add in chicken. Season chicken with a pinch of salt and pepper. Cook, stirring occasionally, until the chicken is cooked through, about 5-6 minutes. Next, crack the eggs into the pan. Scramble the eggs and cook for a few minutes, until the eggs are cooked through. Add the sweet potato noodles back in. Pour in the sauce and mix. Add in green onions, cilantro and cashews. Toss to mix and then serve. What kind of spiralizer do you have? I just bought one that takes literally 30 seconds for an entire potato! This looks so good!! I’ve been craving Thai food ever since I started Whole30. I can’t have cashews so is there something else I can use? Thank you! You could use almond butter or sun butter instead of the cashew butter and use chopped almonds or another nut for topping. We hope you try it out and come back and let us know how it goes! Thank you! I’ll try almond butter. Made this tonight and my 3 “foodie” kids LIVED it! I was hoping to eat the leftovers for lunch tomorrow but my 7 year old daughter already claimed it for her school lunch! Also, I subbed almond butter and chopped almonds for the cashew butter and cashews because my 9 year old son is allergic to cashews. I also added some broccoli slaw to the noodles for more veggies! So good! The kids said I must make this again soon!! Thank you! Great idea adding the broccoli slaw! I’m making this for dinner tonight and I happen to have a bag in the fridge! Can you sub zucchini or butternut squash noodles for the sweet potato noodles? This looks so good! YES! You absolutely can! If you use zucchini though, make sure not to overcook the zoodles so they don’t get mushy. Let us know how it goes! This dish was so simple to make and SO GOOD! I used a Magic Bullet to blend the sauce because I wasn’t happy with the consistency I was able to get by mixing with a fork; it turned out creamy as suggested in the recipe. I’m on Whole 30, day 7 and was craving Thai food. This hit the spot! Best dinner I’ve had since going paleo! I’m not even a fan of Thai food but I couldn’t get enough. I’ve already made it 3 days in a row for my husband and our friends. Thank you so much for this recipe and for your whole site I’m obsessed and so excited to try more!!! I made this tonight and it is actually better than the Pad Thai I used to get at the local Thai restaurant! It made a lot (just hubby and me) so I was wondering if it can be frozen and microwaved. That’s such a great review! We haven’t frozen this recipe but you could try it and let us know how it goes. So excited to try this recipe!! My husband can’t have fish sauce though… will it make a huge difference if I leave it out? Or can you recommend a substitute? You can leave it out. It will make a difference in flavor but you could add in a little more coconut aminos if you’d like. The only substitute I can think of is oyster sauce but I can never find any without added sugar. Let us know how it goes! This is the most delicious Whole30 recipe I’ve ever made/eaten! Even my boyfriend who doesn’t like giving up real noodles absolutely loved this! It tasted like real pad thai – I felt like I was cheating. So so so delicious. I made this with almond butter/almonds instead of cashews and it was delicious! I tried it two different ways – one with sweet potato noodles and one with zucchini noodles. Both were good but I preferred the sweet potatoes because they weren’t so watery and they really complimented the flavors in the dish. I made this for dinner tonight. We were sorely disappointed. This had a weird taste and we tried to like it but no, it was just awful. I filled the recipes to a tee. So disappointing I was looking forward to a good whole 30 meal. I hate to post a negative comment, because there were some 5 star reviews. Not in my opinion. Sorry to hear that, perhaps you used an ingredient that had gone bad? Would this still be good without the fish sauce ? We haven’t tried it, but if you omit the fish sauce add a little more coconut aminos to replace it. But really, don’t be afraid of fish sauce it’s delicious!! This recipe was great! I used frozen butternut squash noodles and subbed sunflower butter for cashew butter and the sauce was creamy thick with a lot of flavor! Thank you so much for this recipe! It’s always a challenge to find something that both my boyfriend (non-paleo) and myself (paleo) really love. We also are not the biggest fans of veggies, but it’s part of adulting! 🙂 This recipe really killed it! It was easy, especially when I cheated and bought pre-spiralized sweet potatoes. It was also super filling, full of veggies, AND we both thought it was delicious! This is now going into my regular menu rotation. THANK YOU! This was delicious! I replaced the chicken with shrimp, and all of the flavors were phenomenal. I will be making this a lot, thank you for sharing the recipe! You’re welcome, glad you enjoyed the recipe! Should this use white wine vinegar or regular white vinegar? Either would work but we used regular white vinegar. This is literally the best thing I’ve ever had. So good. Idk how I’m going to keep myself from making this every single night. Thanks guys! Oh wow, what a great review! Thanks for trying the recipe, we are so glad you love it!